Elk Tracker Elk live in America's toughest habitat and require maximum effort from those who hunt them. Our Elk Tracker series is built just for such a hunter, with a Bulls-Eye® Air Bob Aggressive sole for excellent traction and a lightweight, shock-absorbing comfort cork midsole. 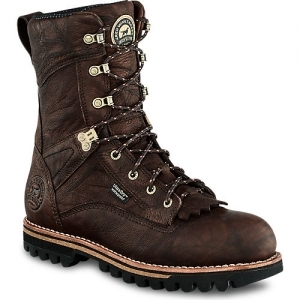 The waterproof, full-grain leather uppers offer support and durability. The Elk Tracker 861 features these technologies: UltraDry™ Waterproofing System Our UltraDry™ construction combines a moisture management lining with waterproof components for dry, long-lasting comfort and performance. ScentBan™ An Irish Setter exclusive scent control process, ScentBan™ is added to various materials from leathers to linings to footbeds, killing bacteria that cause odors.